Brick Bay Sculpure Park. Matakana, North Auckland. Koru is a major earth work sculpture made to celebrate the essence and joy of life at Brick Bay, North Auckland. The spiral form acknowledges land that was once densely forested with ancient kauri. Ten ‘islands’ form the koru and gradually rise from the lake. 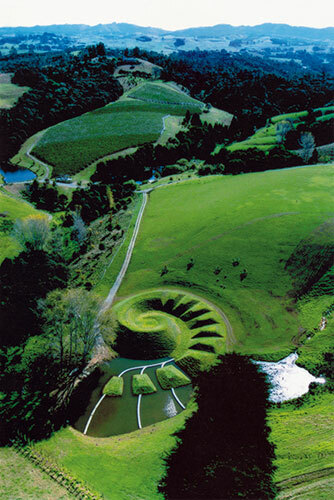 Three are lower islands within the lake, and the other seven complete the koru, appearing like some huge fossil lying on the hillside. The contoured earth forms spiral to a height of ten metres, where a level space at the centre creates a ten-metre diameter performance area. Narrow walkways linking the first three islands transport visitors across the lake into the Koru entry with the occasional sheep or Pukeko. Dimensions: Diameter 80000mm across mounds x Height rising to 10000mm.